Fancy’s Swimsuit Edition…..Wearing Whatever the Flip I want…….. I typed. Retyped. Started a new draft, with new thoughts. Went back to the old draft. I made sure I covered all the past things that got me here (mean high school girls, chocolate gravy for breakfast as a little girl, hysterectomy at a very young age). And all that just took up too many words and seemed to STILL miss the one main point of this post, all together. All I really need to say is this….I have fallen in in love with my body. And with that said, I have some killer swimsuits this season that need their moment. So please allow me to introduce you to some great swimsuits for those of us with a little oomph and extra! 🙂 Of course, they come with a few paragraphs of life lesson, which I hope you won’t mind! Frankly, I just do not care about how uncomfortable you are with how fantastic I feel about myself, nor do I care to suffer through an Arkansas summer more covered than necessary (I HATE THE HEAT)! It makes zero sense to be this in love with a body that needs so much improvement. But I truly love it. I actually don’t want it to look too much differently than it does now. I mean that. I have come a LONG WAY in ceasing to compare myself with other bodies. 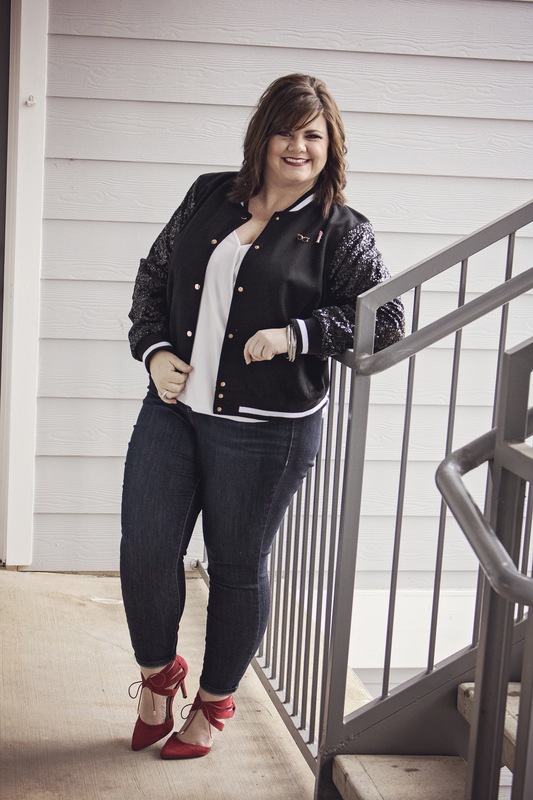 It feels SO GOOD to look at a pic of another woman and think “she is so pretty” or “I love that outfit” versus the other horrible comparisons I would do, or even worse, trying to find someone that I thought looked bigger and worse than me so that I would feel better about what I currently looked like. I am so ashamed to admit that I did that. I want this body to be healthier. I don’t want gravity to take over. I need the fine lines and wrinkles to simmer down. However, this poor body has carried me through some terrible times. It has had the worst neglect and too many “I’ll start tomorrow”, to count. It has been beaten and spit on. In it’s current state, literally every day that I wake up, it has to decide to fight against an illness I like to pretend I don’t have. Lately, walking at all is more of an accomplishment than I have shared with most of my people. It could’ve failed me long ago. It could’ve put out a completely different reflection, based on what I have put in it over time. But it hasn’t (thankfully!!). So, I owe it a bit more credit than I have given it in the past. PLUS, I decorate it pretty well on most days! I know how much work it took, to only take way too long to get here. The last thing I want is to contribute to any other little girl or woman watching me attack myself and thinking it’s ok. I try to be especially careful of what I say about myself when I am in front of my nieces or friend’s kids (or on first dates, for the matter). It’s VERY important to me that I do all that i can to influence them to value themselves, just the way they are. It is my passion that every girl feel good about and love herself. I mean that with every fiber in this newly loved body! So when I walked out of my room in my swimsuit and my nieces said “Oh Auntie Ricia, I love that suit. You look so so pretty!! 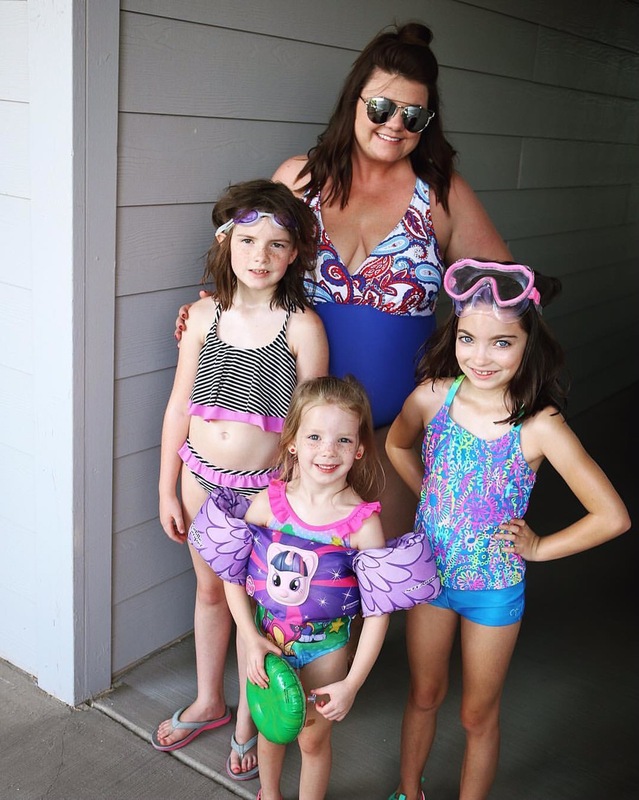 !”, and when they were the ones who pushed for me to “put it on your Instagram” …..I figured today was just as good as any to do the swimsuit showoff I have wanted to do for so long. I want them to see me loving my body and being ok with whomever may see it. 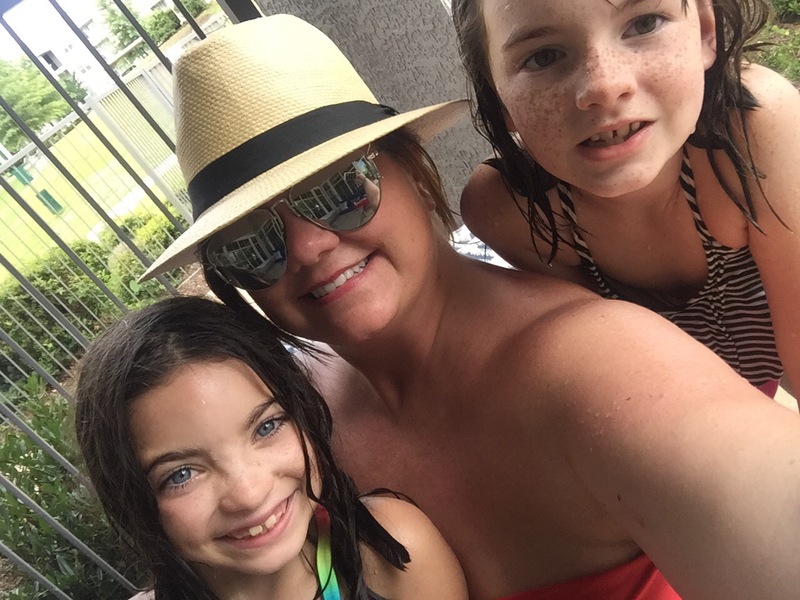 I had been waiting for the perfect situation (makeup, hair, tan, someone to help me snap the pics, perfect weather, not bloated….miracle major weight loss, bla bla and so on)…when all I really needed were a couple of 8 year olds saying “put your hand on your hip and smile bigger”. I wanted to even hire someone with mad photoshop skills to do a little smoke and mirrors. But, that would defeat the purpose of the lesson, right? Hold please, I need to pause and take another deep breath. I cannot believe I’m doing this. ANYWAY……the process was pretty hilarious and has made for an awesome memory for them. We got caught in a storm while we were at the pool, doing the initial shoot. We powered through and then made a mad dash back to my apartment, completely drenched (see “after pic directly below)! 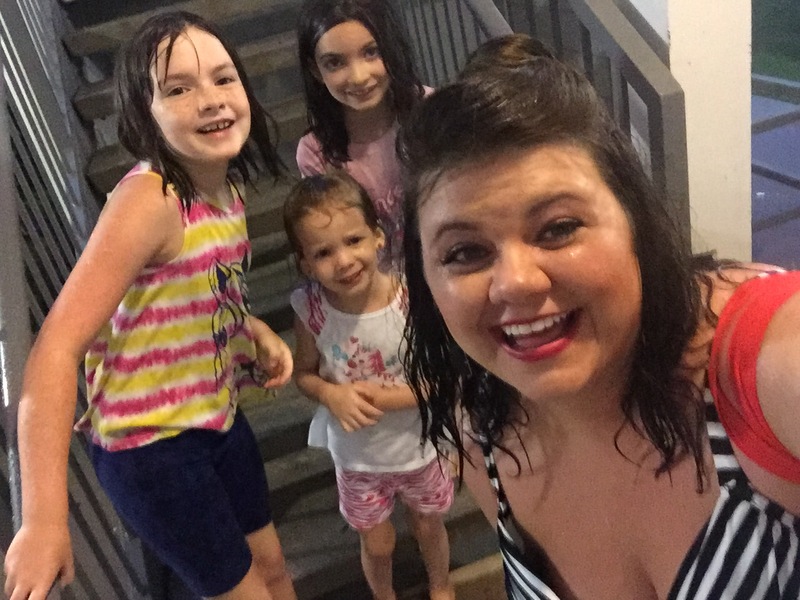 Even though most of those pics were ruined and we had to call reinforcements in for help, the littles learned a lot about dancing in the rain and finding the good in not ideal situations. They went from being a bit scared of the storm, to getting back upstairs and saying “THAT WAS SO MUCH FUN, AUNTIE RICIA”!!! Mission accomplished!!! I think it’s funny how this whole life thing is working out. I’m aware of the bad decisions that got me in this physical state and I long to be healthier. I had no idea how hard the mental road to reverse lifestyle and upbringing would be. I get SO FRUSTRATED that now my body just can’t cooperate that easily to just get healthier. 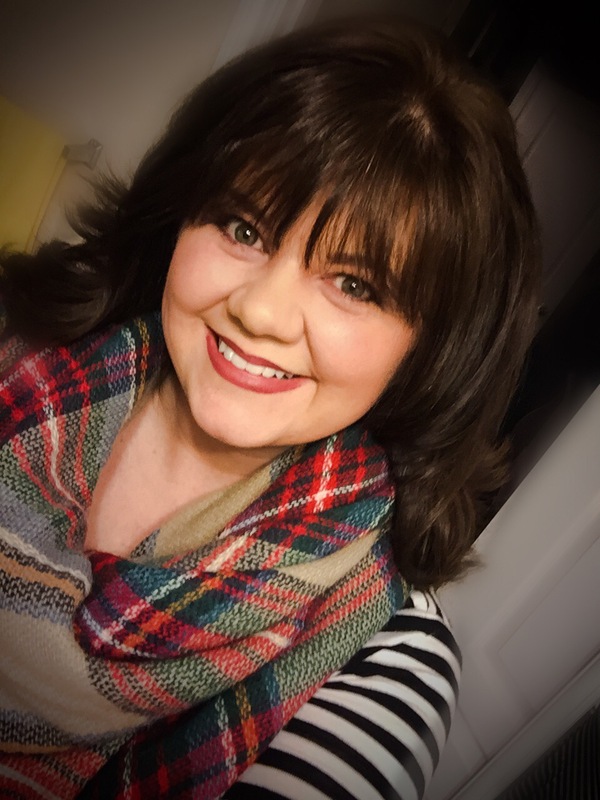 I am angry at an illness that provides hurdles and still struggle with the looks I get from people when I try to explain (you know that look of “if you would just lose some weight you would……be this or that). But even in this state. I’m also the happiest I have ever been. I love how kind life is back to you , when you try to work alongside it versus fighting it or going your own road. The scale may not show it, but in many ways I have shed weight. The weight of toxic people (and more of that is in the works). The weight of trying to please others. The weight of saying yes all the time. The weight of worrying myself sick about what others might think or how they spin their side of a story (it’s really none of my business what people think or say of me). That alone has probably shed thousands of pounds 😛. I am consciously trying to be kinder and speak love and encouragement to others. I am declaring that I absolutely refuse, from this moment forward, to make one woman feel better, by tearing another down (i.e. Oh his new girlfriend is way uglier than you). This week, my nieces showed me that they genuinely think I am beautiful. So I guess I should let myself believe it too. As a matter of fact, I have no intentions of hanging out with anyone who doesn’t see me the way they do, anymore! I hope when they are older, they come across this rambling and know what a cool day this turned out to be! I’m promising myself that I will believe in this post. I will not worry or let my mind wonder to a place where there are screenshots and memes made and conversations behind my back! I will try my best not to worry about a few that I know would never say anything to my face, but will definitely not agree that I should be this comfortable being this fat, much less putting it all on the internet. I’m not going to give in to worrying about how much better I would look if I actually had knees 🙂 (for the record, I never really have, even at my smallest). I will be forever thankful for three little girls who made me feel like the prettiest girl in the world (and a few friends who go out of their way to make me feel that way often!)! I wore the two piece the rest of the day, while we played and enjoyed some sunshine. It felt so fire!! Look at this look! It screams comfortable and relaxed!!! Ah, the holidays! One of the most fun times of the year! Christmas decor, holiday parties, ugly sweater goodness and now A NEW DOLLY PARTON MOVIE (just what I needed to continue to feed my love for her)! 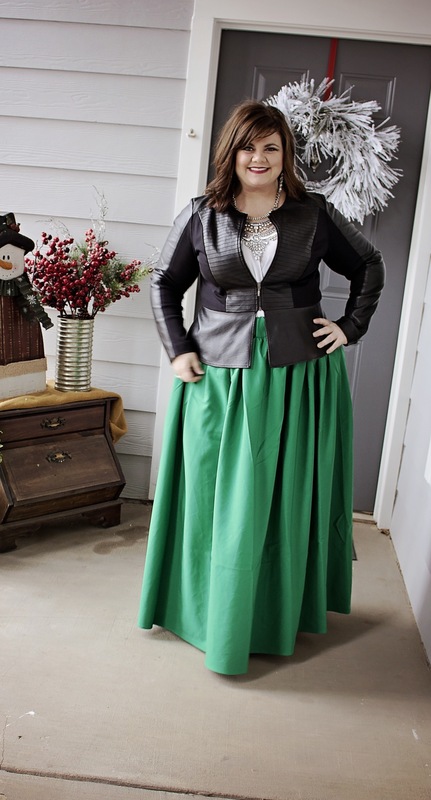 In honor of her Christmas movie airing today (that I have been anxiously awaiting for and assume you’re watching), I’m not only sporting a snazzy, what I hope would be Dolly approved outfit to work, I’m giving you a sneak peak into my holiday party outfit options. Even though I have a feeling I know what Dolly would pick, I’m going to let you vote on your favorite look! Whichever one gets the most votes (no matter which one I’m partial to, you know, kinda like an American election), is what I will wear to the party. Promise. 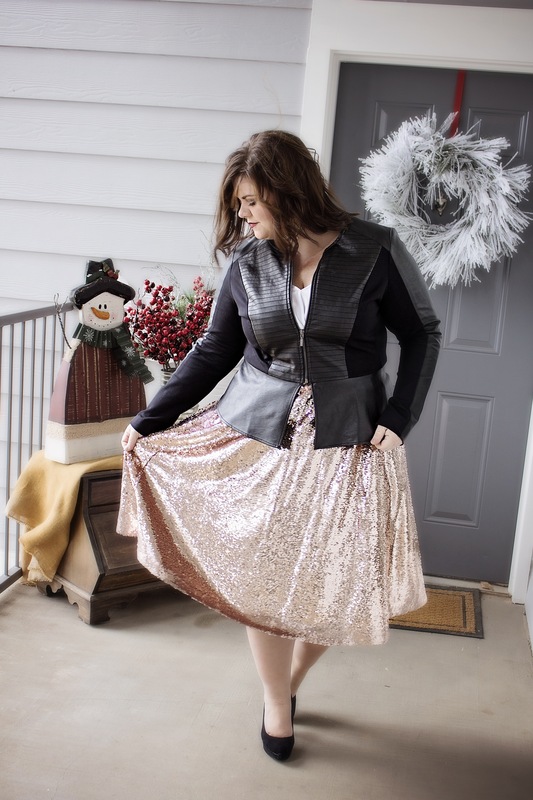 In addition to some great outfits (or what I feel are great outfits), I’ve also put together party prep list! Enjoy! I can’t wait to see which outfit wins! Understand the party dress code. Then, wear what you want anyway. Make sure that what you wear won’t get you fired. Pre-game. This step is important. Do something to relax you before going into the potential sea of judgement and lame office jokes (thankfully, our office party is guaranteed to be lame free so I’m not even worried. I’m just saying you should be aware of the potential for you to encounter lameness). Have a couple of glasses of wine. But stay away from shots of tequila (until you get to the party and you see your boss throwing them back). Turn up some good music while you’re getting ready and dance like you’re a star in a Paula Abdul video. Make sure if you’re taking a date, that he/she isn’t lame. Assume everyone that is staring at you is only thinking how fabulous your outfit is and how they wish they would’ve dressed more fun. If there is music, dance. Even if you wouldn’t normally do such a thing. That’s it. That’s all you have to do (other than stay sober enough not to stick your foot in your mouth). 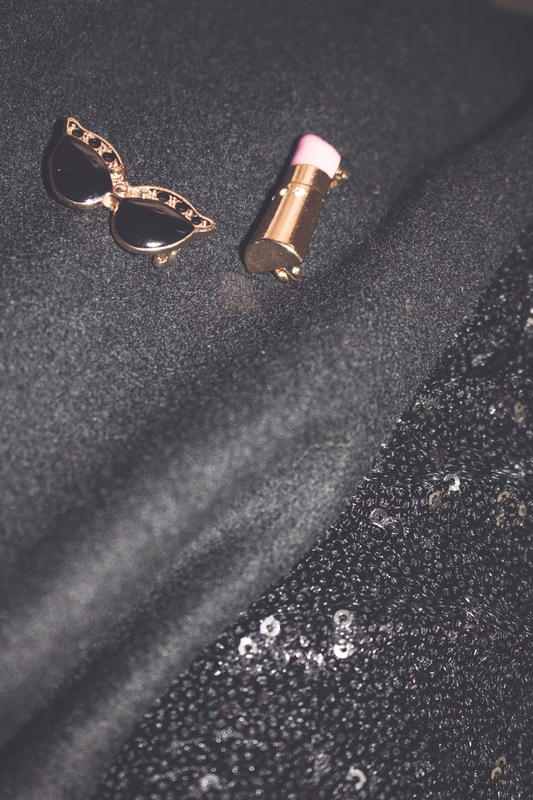 The party is a dressy casual event. 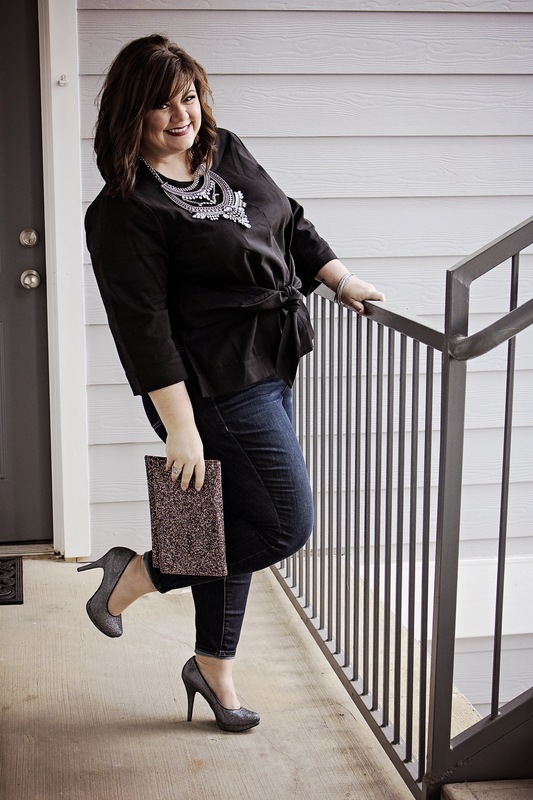 Most will wear jeans and a nice top or a fun dress. When discussing the attire during our staff meeting, it was well established that they could make whatever decision they wanted, but that I would be wearing snazzy stuff no matter how casual they decided 🙂 Funny enough, nobody in the room seemed surprised by my announcement! I was worried this look would look too plain. Turns out, I ended up thinking it has the perfect balance of casual and snazzy! 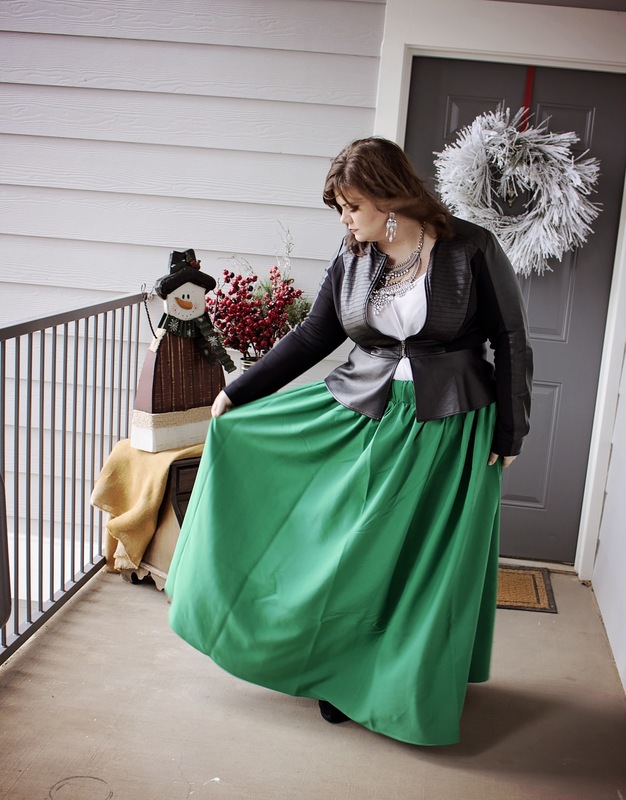 I am in love with this skirt and how well the necklace compliments the outfit!! Guess what else? The skirt has pockets!!!!!!! Winning all around! I don’t want to influence or rig the voting (too soon? ), but I cannot deny that this one is my favorite thus far. It’s magical. Just look at how fun it is and how it fits! So, let me hear it! What’s your favorite? Today’s shopping in my closet comes courtesy of copy catting. I have seen plaid and stripes a lot and been wanting to try it on myself. I am sure some of you out there can relate to a fear of putting stripes on a bigger body. But, if I am gonna live unapologetically this year, I can’t say I am sorry for trying off beat patterns. It is probably still too soon to wear this dress for the stomach I still have. But i did it and I am not sorry. 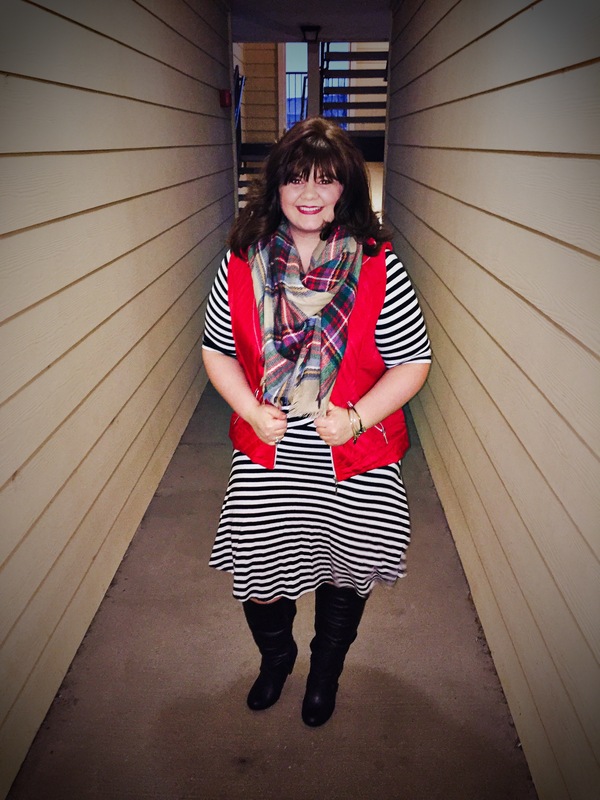 This dress was made to do you favors and those criss-cross stripes are my friend! Most importantly, it’s all comfy for the all day meetings I am headed into. Luckily, thanks to great hair and good lipstick, my only decisions are how to manage my water intake to bathroom trip ratio when I am stuck in a conf room all day!! I dare you to wear stripes and plaid. And I dare you to have a good day doing it! !